Media captionAndrew Neil tells us five things the $52.4bn (£39bn) tie-up could mean. Nobody could have predicted - and to the best of my knowledge nobody did - that Rupert Murdoch, the cunning Australian with news in his veins and unquenchable fire in his belly, would be a seller. Not like this anyway. It took the charm of Bob Iger to make it happen. They met over the summer. Iger undoubtedly has one of the most impressive track records of any chief executive in media, and the other qualities that have led to his being talked as a future presidential candidate. Interviewed this morning, he didn't deny political ambition. But the extension of his contract to 2021, to the delight of investors, and the fact that James Murdoch's future is uncertain - he wasn't mentioned in the statements from either company - exposes earlier stories about Rupert's younger son becoming boss of Disney for the nonsense they always were. That story was presumably briefed out by the Murdoch camp, and it is possible that he could yet end up with a senior position at Disney. But Iger's diplomatically chosen words on the subject today, saying that "he will be discussing whether there is a role for [James] - or not - at our company" were not flattering. One key point about the deal is that it isn't done. If it doesn't go through, according to Andrew Ross Sorkin, there is a $1.5bn break-up fee. And if regulators block the deal, Disney would have to pay around $2.5bn. With deals like this, the moment they go public and the agreed figures are in the public domain is the very moment that other potential bidders can make the best judgement on whether it is the right price - as well as an informed call on whether they ought to bid themselves. Image caption Disney's chief executive, Bob Iger, on the Star Wars red carpet in London. He says he wants Sky News to carry on. The sums involved - $39bn all in stock - are not actually gargantuan to some tech companies, whose market capitalisation approaches a trillion dollars, and whose cash flows are both vast, reliable and growing. Moreover, there is the question of not one but two regulatory quagmires. Disney's bid will take months to be cleared by anti-trust investigators in America. And Fox's bid for the 61% of Sky it doesn't own is still ongoing. Iger indicated he wants Sky News to carry on. The case for it is that it has political influence and is a world-class product which boosts his brand. The case against is that it loses money and is stuck with regulators. It's far too soon to predict what will happen to it. These regulatory delays create a window for another potential bidder. Until the assets are transferred from one owner to another, deals are a form of flirtation, albeit an expensive one, like going on a pricey date as a prelude to marriage. During this window, the other thing that could happen is poaching of top talent, both on and off the screen. All the senior executives at Fox will have been greasing up their industry contacts in recent weeks, since news of this story broke. And rest assured a few will have been in touch with Iger's office too. Expect Netflix, Amazon and Apple to do some poaching soon. Those companies are silent but central players in this deal. In recent months Rupert Murdoch has been saying, both in public and private, that he feels their vast power is something even he will struggle to defeat. 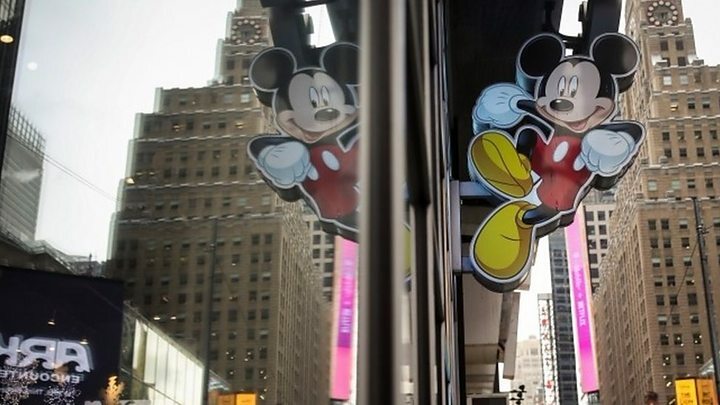 The brutal truth is that Fox, valued at around $75bn, and Disney, valued at more than double that, have realised that on their own, they are too small to compete with the digital giants. In other words, a cunning fox and a mighty Mouse (I'm talking about Mickey) realise that they need to club together to take on the big beasts prowling the broadcasting jungle. On their own, they're just too small. Rupert has realised that the company that he has spent a lifetime building, with all its political influence across news and entertainment, and a vast audience spanning the globe, just can't compete. The reason for this is that in media now, scale is everything. The future of this industry belongs to those who can marry the best content (smart ideas and excellent stories) with the biggest audience. To get the former to the latter you need a brilliant distribution system. This is called the internet. In the internet age, the companies that have the biggest audiences or customer bases are best placed to monopolise the attention, and payments, of customers. That's the thing about Apple, Facebook, Google and Amazon - all of them now very much in the media business. They've got a direct route, or distribution system, to a very big audience. What they need is content to give to that audience. This marriage of content and distribution explains Disney's motivation. They want great content from Fox as well as access to millions of new customers. This acquisition would give them scale. Scale is precious in media because of how streaming has changed the business. Media used to be about scarcity: a finite number of shows on a finite number of channels and - crucially - a finite number of opportunities to watch them. Now, media is all about abundance: a seemingly infinite number of shows, which you can watch on multiple screens, at a time of your choosing, in a manner (live, staggered, saved for later, whatever) you like. That is why this is the golden age of television. In an age of super-abundance, and endless consumer choice, the big push out the small, because they are able to lock us into their hardware systems (Apple), or social media feeds (Facebook, Snapchat) and colonise our minds, leaving less room for distractions from other, smaller players. Where does the UK fit in? These companies share some characteristics. They are worth tens of billions of dollars. They are American. They have a very, very strong - and strengthening - grip on our loyalties and attention. They have very direct routes to us, via the internet. And they have some amazingly high-quality stories. What do these companies have in common? They are British, worth a lot of money but not tens of billions, and developing powerful digital offerings - though not fast enough. They are staffed largely by very creative and industrious people. But their organisations are geared around the consumption of linear TV - that is, scheduled programming consumed mostly through a television set - at a time when the world is shifting to mobile. And what of the BBC? How can it compete? I am always told by senior executives in the broadcasting industry that this is not a zero-sum game: because of co-productions (shows financed partly by the BBC and partly, say, by Netflix), the BBC can benefit from the growth of digital services. Sure, I get that, but spare me the bromides. The fundamental fact, as I have reported extensively over the past year, is that the BBC's budget is finite, and under £4bn. . It is not growing. In other words, on the content side alone, the BBC has a pretty fixed amount to spend in an industry that is swelling fast. Its relative size is diminishing. Netflix alone will spend between £6bn and £8bn on content next year (not all of it original of course). And Netflix is small compared to the potential of Apple or Amazon. If Rupert Murdoch thinks his $75bn company is too small to compete with the digital giants, what on earth does that say about the BBC, itself a giant in Britain? And what, in turn, does it say about the relative clout of Channel 5, for example? When, nearly 50 years ago, Rupert Murdoch bought the News of the World as an outsider and began his long march into the heart of the British and American establishments, it was news, and sport, that stirred his passions. He completely reinvented Fleet Street by smashing the print unions and pushing editorial boundaries. He essentially created satellite television in Britain, massively increasing choice for millions of customers. It was the news industry that gave him influence. But it was the move into entertainment, particularly in America, that made him supremely rich. Now, in his mid-80s and recently married, he is retreating back to his comfort zone of news and sport. As Andrew Neil - who was Murdoch's editor at The Sunday Times for years, and founding chairman of Sky - put it to me this morning, this represents the "unbundling of an empire". I am told by people familiar with his thinking that this move was instigated by his more digitally savvy sons. Curiously, however, this could split the family, in business terms at least, with Lachlan clinging to Rupert and James departing. James Murdoch is frustrated by the toxicity of Fox News, whose politics he doesn't share, and at just 44 is young enough, and Murdoch enough, to either launch something or take a big job in another company, especially if it comes with the promise of being chief executive eventually. Rupert Murdoch might be the shrewdest man ever to run a media company, and in selling up for a good price while his company faces structural threats that mean its value could be close to peak, he may be right to exit. But there is no getting round the fact that the man who spent five decades trying to build a dynasty has been tamed by the internet. Six years after he said it in a very different context, today was the humblest day of Rupert Murdoch's life.